Lifelong Learners Live Longer: Is Continuing Education a Fountain of Youth? There are myriad good reasons to go back to college. Learn a new trade, improve your earning power, and beef up your résumé, to name a few. But there’s one reason even more compelling. You could actually live longer. And not just longer, but better too. Now, I could expound on how a life spent in the pursuit of knowledge carries enormous intrinsic reward, that a constant endeavor for personal enrichment is a kind of wealth that money can’t buy, that a well-rounded person is often well-liked also. I could get into all of that. But it’s probably more compelling to tell you how you can improve your chances of living to 100. Obviously, plenty of factors matter. Being well-learned doesn’t compensate for other risk factors. I wouldn’t read Zen and the Art of Motorcycle Maintenance while riding a motorcycle. But, adjusting for risks, a life spent immersed in education is a life with better odds of being long and fulfilling. And as you get older, this gets truer. The Harvard Business Review points to research directly correlating longevity and education. Though the exact causation remains inconclusive, a 2006 paper finds that a single year of formal education can add more than half a year to a person’s lifespan. Of course, a correlation exists between education and earnings, as well as tendencies toward healthier lifestyle decisions and avoidance of risk behaviors. But evidence also suggests the simple act of remaining engaged in the learning process throughout your life can have provable health benefits, especially on your neurology. The Harvard Business Review article reveals learning to play a new instrument or speak a new language, for instance, offsets cognitive decline. The article also notes that learning a difficult new skill later in life is associated with improved memory, so if you think it’s too late to master a soldering iron or weave a basket, think again. Some evidence even shows ongoing education can, and should, be a part of the treatment strategy for individuals battling neurologically degenerative conditions. Though you can’t necessarily alter the underlying pathology of conditions such as Alzheimer’s disease, you can delay symptoms by reading a little bit every day. If the brain is not challenged with new learning, its capabilities can gradually erode over time, leading to decreased memory and cognitive function. As these functions decrease, risk factors and mortality increase dramatically. In short, boredom isn’t great for your health, so get out there and do something. If physical limitations prevent this, then get active online. The cool thing is that your continuing education won’t just give you a shot at living longer. It can help to make those later years all the more golden. If a preponderance of obligations and the sense that you never have quite enough time to get it all done describe your present life, your senior years can be quite the opposite. A recent retirement or the departure of your last adult child from home could find you suddenly flush with time. Education is more than a way to keep idle hands busy. It’s a way to do and learn things that previous obligations might otherwise have prevented. Now, you finally have the time for it. According to an article in Psychology Today, this means participating throughout your adult years in social, cultural, economic, spiritual and civic activities. Health, in this context, refers to physical, mental, and social well-being. For older adults, these dimensions of health are deeply interdependent. It’s especially important for aging adults to remain active in each of these areas to improve general long-term health outcomes. Cognitively active seniors were 2.6 times less likely to develop cognitive impairments such as Alzheimer’s disease or dementia than those engaged in less cognitive activity. A 2012 study called the Rush Memory and Aging Project observed more than 1,200 Chicago-area seniors — average age of 80 — and found “cognitively active seniors” were 2.6 times less likely to develop cognitive impairments such as Alzheimer’s disease or dementia than those engaged in less cognitive activity. The study concluded that increased cognitive activity slows cognitive decline. This doesn’t just mean that it can help to delay the onset of neurological illness. It means mental activity can also help generally healthy older adults stay sharper longer. Psychology Today found that older adults who participated in educational opportunities inherently saw less or slower cognitive decline than their non-learning counterparts. In comparative findings, lifelong learners enjoy a higher quality of life, even after controlling for other variables. So, as an aging adult, you don’t merely benefit from improved cognitive ability but from all the perks that come with it, from the ability to be productive and functional to the wherewithal to form and maintain meaningful personal relationships and commitments. Stated simply, your ongoing education opens the door to living a fuller life. In addition to the cognitive and social gains — and because of them — clear emotional benefits to lifelong learning arise. Psychology Today reports enriched learning environments help older adults cope with depression and poor self-image. One reason is that learning creates a sense of personal control that can otherwise be fleeting as we age. In a Brandeis University study of more than 3,600 adults between the ages of 32 and 84, researchers sought to determine what role certain positive factors played in long term health, especially as subjects aged. If knowledge is power, learning can be a good source of compensation when your joints get creaky and it takes you a few tries to get up from the couch. As we age, we often feel this control eroding, especially as both our physical ability and earning power decline. So these control beliefs lend a particularly compelling appeal to a life spent in pursuit of knowledge, understanding, internal depth, and intrinsic reward. If knowledge is power, learning can be a good source of compensation when your joints get creaky and it takes you a few tries to get up from the couch. It’s true that we begin to face physical limitations as we age, and these have a negative impact on our control beliefs. While one’s sense of control is a matter of individual nature and life circumstances, evidence shows control beliefs are in peril of declining as you age, no matter your life’s circumstances. Here’s where a class about art history, a woodworking course, or a foreign language program may really spark a sense of purpose, and with it, a renewed feeling of control over your immediate world. You may even make peace with the things both large and small that you can’t control. We can’t promise these results, but if you do manage to find either control or solace in an ever-expanding body of knowledge, there’s cause to believe that beyond living longer, you’ll enjoy a higher quality of life. That makes you as good a candidate for college courses as any fresh-out-of-high-school applicant. What are your goals as a lifelong learner? Want to complete a single encompassing course of study to master one academic area such as classical literature or Greek mythology? Or are you more interested in obtaining a specialized skill such as pastry decoration? Hoping to design your own website, participate in a one-act play, or improve your knowledge of politics and government so that you can get more involved with your local community? Before taking the plunge, decide what you hope to achieve. This can clarify for you the kind of educational experience that promises the best benefits, both practically and cognitively. How much time can you devote? Are there health limitations that you’ll need to navigate? Would a class on community organization serve you better than a kickboxing instruction certification course? We’re not telling you to forgo the kickboxing certification but to qualify your plan by asking pertinent questions about needs and goals. Make your ambitions realistic. Don’t overextend yourself, lest overexertion or risk overshadow any health benefits. If you have arthritis, for instance, a welding class may be a bad idea. Choose something that matches your passion, your ambition, and your ability. Step out of your comfort zone if you can, but do it with proper safety precautions in mind. Once you figure out what you want to do, find other people who are doing the same thing. Engagement with others is an important part of an enriching and encompassing educational experience. If you plan to take courses on-campus, at a community center, or in an adult education academy, you’ll find that community all around you. Still, it’s up to you to engage your classmates and your instructor. This is a great chance to make new friends and share new ideas. If you’re planning to take online classes, finding your community may be more challenging. Reach out to your instructor or classmates and see if there are forums where you can engage others as you learn. For any given subject or class, likely countless social media forums and online communities exist where people are eager to share thoughts, pose inquiries and, of course, debate (oh, how they love to debate). Join the communities that feel most inviting and illuminating to you. Membership can enrich your complete learning environment. Whether you’re taking classes in person or online, master the computer, the web, and the applications you’ll need to succeed. Remember, you’re doing this to grow and feel stimulated, not to shout profanities at a computer screen for not doing what you want. Know the basic functions of a computer, laptop, and/or smartphone; typing and word-processing; web searches and online libraries; and email, chat forums, and social media. Some of these applications will be essential for your participation. If you’re taking a creative writing course, you must be able to type, save, and print an essay. If you’re taking a cooking class, you’ll want to know how to find the best recipes online. And regardless of whichever classes you take, understanding the ins and outs of social media can help immerse you in your educational community. Of course, if you plan to take your courses online exclusively — an especially good option if you have physical, geographical, or economic limitations — knowing how to use your computer and the web efficiently will shape your experience for the better. If technology is alien to you, find a friend or relative who can lend you a few pointers. And don’t be intimidated. That computer is just as afraid of you as you are of it. Just kidding. Chances are, it’s user-friendly and you just need a little guidance in the right direction. You can also check out our Savvy Student’s Guides to Computers and Smartphones for college. Already a technopro? 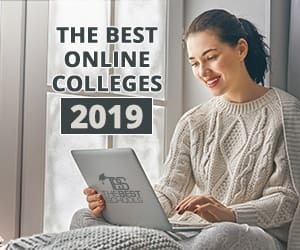 Then dive into the 50 Best Online Colleges & Universities 2019. You have a tremendous advantage over traditional students insofar as you don’t need to earn a particular degree, impress a specific employer, or focus on a nonnegotiable salary objective. You’re in this for you. Study what you want. You’ve finally reached the point where you’re learning for learning’s sake. Oh, yeah, and for the sake of living longer … which should be a pretty good motivator.